The existing upgrade paths from legacy PBX and ACD suppliers make it difficult for contact center executives to contemplate the future of customer service on their own terms. 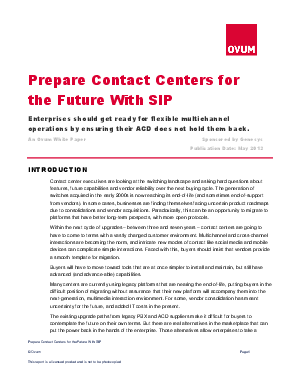 If your ACD-based contact center has become a road block for adding capacity or adding channels such as social media and mobile, you might want to think about making the switch to a SIP-based contact center solution. SIP is based on open standards, so you can choose hardware and software that is best suited for your environment. SIP’s capability extends beyond voice to new media types such as mobile, social media and video. Learn more about how to build the next-generation customer service platform.